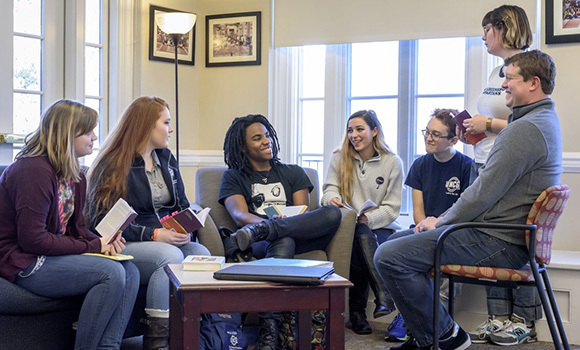 Residential college students (left to right) Abby Schleifer, Heaven Rogers, Samata Allen, August Simmons, Sam Peltzer and Sadie Rudd participate in a discussion with Dr. Will Dodson (far right), the live-in faculty member at Ashby. Walking into a classroom at UNCG’s Ashby Residential College – the oldest of its kind in the state – feels a little bit like being transported to a small liberal arts school. It’s a close-knit community where undergraduate students can build relationships with professors, draw connections across classes, and engage with one another through co-curricular offerings. Since 1970, UNCG’s residential college community has grown to include three colleges with different themes. Ashby focuses on digital communication and ethical engagement, students in Strong explore all aspects of sustainability and Grogan is designed for students in UNCG’s professional schools. Students in the two-year program take courses that correspond with the theme of their residential college, and they also have the opportunity to complete all of their general education requirements through the program. Faculty members from a variety of disciplines collaborate closely with each another so that students can explore common themes across their coursework. The community has one live-in faculty member, while other professors have offices in the residence halls. And that’s what makes the residential college community so unique. It’s not themed housing – it’s a completely integrated learning experience. For Samata Allen, a psychology major with a minor in drama, Ashby was a key factor in his successful transition to life as a college student. History major Heaven Rogers has found the same kind of academic and social support in Ashby. She also values the diversity of the community, and the way her professors encourage all viewpoints to be shared. “The majority of our classes are discussion-oriented. We’re trying to open our minds to other ways of thinking,” she said. Littlejohn is the first to tell you that UNCG’s residential colleges are not for everyone – they require a deep commitment to interdisciplinary learning and social engagement. But for many, the community is just what they need to be successful. “This is the way to have a small liberal arts college experience inside the context of a large public research university,” she said. What does she hope students will take away? Strong critical thinking skills. Want to learn more? Visit utlc.uncg.edu/residentialcolleges.